Hockey is a game of precision, speed, and power. Success in hockey directly stems from your ability to do things as precisely, as fast, and with as much strength as is possible. Arguably the most important part of any hockey player’s game is his or her ability to skate. But, if you don’t have a quality pair of hockey skates, your skating ability is going to flounder, and your overall game is going is going to suffer. This is why it’s very important for hockey players take great care when choosing a pair of skates. Whether you’re a novice, intermediate, or professional player, the quality of your skates matters. Bauer is one of the premier names in all of ice hockey. The company is responsible for some of the top helmets, sticks, and skates on today’s market. One of their premier skate at the present time is the Bauer Senior Supreme 140. With impeccable and nuanced construction, they provide your feet with both the protection and comfort that is so sorely needed in the sport of hockey. Their quarter package is made of high quality nylon which provides you with excellent foot flexibility while also giving your plenty of support and protection. This will enable you to turn sharp corners with great feel without sacrificing anything in the way of safety. Their interior liner is made of a microfiber material which allows for ultimate breath-ability and sweat absorption. This will provide your foot with comfort all throughout practice and games. Thermo-moldable, the Supreme 140s can be heated and shaped to fit the exact anatomical contours of your foot, making them as snug as possible, and giving them excellent touch and feel at all times. They come in only standard width sizes, so if you have wide feet, you might want to take a look at something else. But, if you’ve got standard width feet, these will accommodate you completely. Its strong plastic holder is a TUUK Lightspeed holder that provides excellent action and which is very responsive to sharp turns and quick stops. Very aerodynamic, it’s attached to a firm, supportive TPR outsole which is both durable and stable. You won’t have any trouble performing agile maneuvers in these skates. In addition to the holder and the outsole, these make use of a TUUK Super Stainless Steel Runner. Highly durable and resistant to wear and tear, this runner glides gracefully across the ice, allowing you to skate at any speed you can muster. The runner does not come sharpened. This doesn’t mean it can’t be used when not sharpened; it just means that it won’t perform as well. If you want them to perform at their best the very first time you use them, you should get them sharpened at an ice rink or other ice skate maintenance location. Online reviewers love these for how light they are, stating that it barely even feels as if they’re wearing skates in the first place. Reviewers also give them credit for how durable they are, with one reviewer noting that he uses them two to three times a week without seeing any problems. Some reviewers complained about their sizing, stating that it’s wise to order a size that is two sizes smaller than your usual shoe size. Other reviewers noted that they were a little stiff to move around in, while a few complained about the fact that their blades can’t be replaced. All in all, the Bauer Senior Supreme 140 Skate is a terrific product for anyone wishing to make their way smoothly across the ice. Combining comfort, functionality, and durability, they will allow you to pull off any stop, turn, or maneuver required of you, all while letting you focus on the game, and not on your feet. If you’re an intermediate player who’s looking to get into hockey competitively, the Bauer Senior Supreme 140 Skates are something that you might want to take a look at. They are available for around $55.00 on most online retail sites. Tour Hockey is a company that makes top of the line equipment for both ice and roller hockey. From sticks, to pants, to skates, Tour Hockey has everything you need to play casual or competitive hockey. 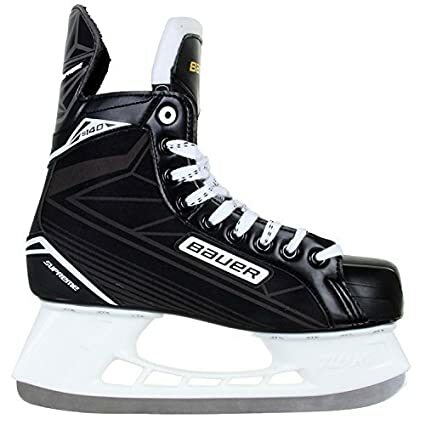 The company’s top ice skates at the present time are the Tour Hockey Senior FB 225 Ice Hockey Skates. With high quality construction and excellent functionality, they will make your time on the ice go as smoothly and consistently as possible. With a reinforced quarter package, they combine excellent foot protection with stellar flexibility. This will allow you to perform nuanced turns and maneuvers with little resistance, and with as much safety as possible. Foam padding works to make these extra cushioned, providing your foot with a great deal of give while also defending it from outside sources of injury such as pucks, sticks, or other skates. Their interiors are lined with tricot lining. This gives your foot a soft but sturdy place to lock into, delivering comfort and support no matter which way you turn. Their tough plastic holders attaches firmly to the boots’ outsoles, allowing for some flexibility in turns but still providing you with a very stable base. With a design meant to cut down on wind resistance, they are very aerodynamic, providing excellent balance and speed. Attached to the holders are very durable carbon steel runners. These will provide you with high quality glide and control while also doing a great job of withstanding wear and tear over time. Online reviewers love these for how easy they are to operate, stating that they glide smoothly and do a great job of stopping on a dime. Reviewers also credit them for how durable they are, noting the stiffness of their quarter packages as well as the toughness of their blades. Some reviewers complained that they weren’t very comfortable, with one reviewer saying he sent his back before he even tried to skate on them. However, this seemed to be an anomaly as most reviewers found them to be perfectly comfortable. The only other negative to point out is that their blades can’t be replaced. You would have to just purchase an entirely new pair skates. 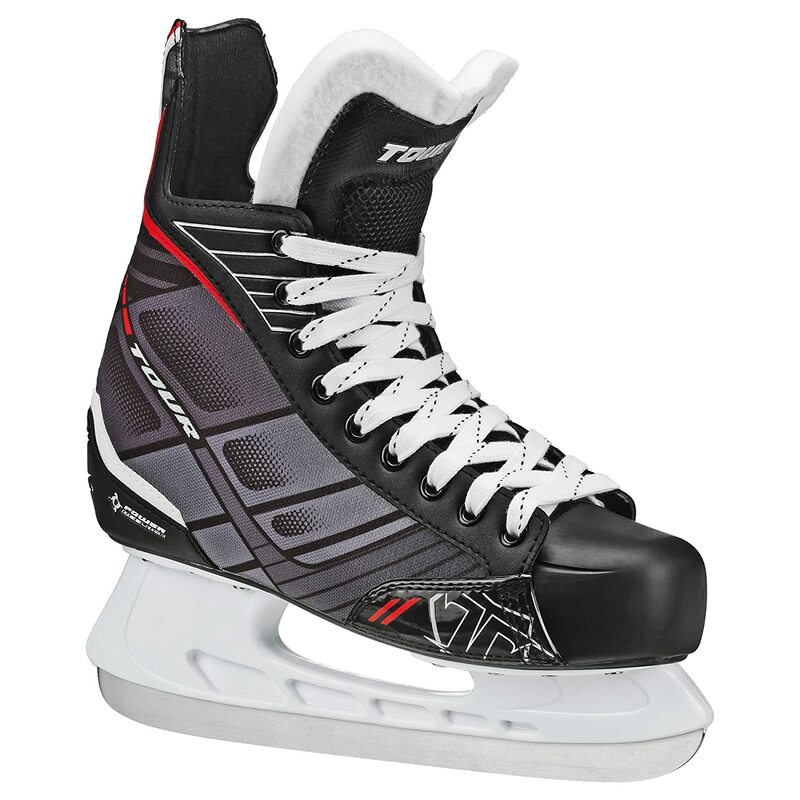 Overall, the Tour Hockey Senior FB 225 Ice Hockey Skates are a great product if you’re looking to play some competitive ice hockey. They glide smoothly, are very durable, and are as easy to control as any hockey skate you’re going to find. 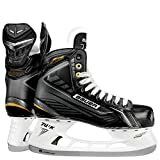 If you’re to advance from casual hockey to competitive hockey, you should definitely give the Tour Hockey Senior FB 225 Ice Hockey Skates a look. They are available for around $45.00 on most online retail sites. Bauer makes our list for a second time with another high quality pair of hockey skates. This time they do it with their Bauer Senior Vapor X300 Skates. They offer you many of the same things offered by the Supreme 140s, but certainly have an identity of their own. Their quarter packages are made of a synthetic material that provides them with structure and flexibility, keeping your feet locked in safely while letting you turn any corner you need to turn with precision and ease. Cushioned padding in the heel, toe, and top of the boot give you maximum foot protection, ensuring that you’ll always be safe from pucks, sticks, and other skates. Though they already provide excellent arch support, these skates have the ability to be heat molded. This allows you to forge the boot to the exact shape of your foot, giving you the most comfortable and snug fit possible. They possess very high quality holders. Attached to firm but forgiving outsoles, these holders make it easy to perform sharp turns at high speeds while keeping your feet locked in at all times. These holders are also very aerodynamic and resistant to wind, keeping them firm, fast and balanced. Attached to the holders are very high quality and durable runners. Made of stainless steel, they can withstand a great deal of wear and tear while also providing top-notch glide and precision. You won’t have to worry about your skates giving out on you. You can just focus on your game. Online reviewers loves these skates for how easy they are to break in. Whether you bake them or just wear them for a while, they will fit comfortably and snugly to your feet in a rather short amount of time. Reviewers also give them credit for how well the skate, noting their ability to glide and perform precision maneuvers. Some reviewers complained about how narrow the boots’ heels are, stating that they were too uncomfortable to wear any longer. However, many reviewers loved this aspect of the boots, stating it kept their feet from slipping at all. One reviewer referred to them as “flimsy”, but no other reviewer claimed anything close to this. All in all, the Bauer Senior Vapor X300 Skates are a high quality product that will suit newcomers and intermediate players just fine. With their great performance and ability to break in easily, they are great in both casual and competitive hockey environments. If you’re looking for something that will provide you with great foot support and excellent skating prowess, the Bauer Senior Vapor X300 Skates are definitely skates to check out. Hockey skates can cost a decent amount of money. That’s no secret. But, maybe you’re a casual player and don’t want to spend a boat load of money on something that you’re only going to use every once in a while. Luckily, there are a number of great skates out there that can be purchased at a bargain price. 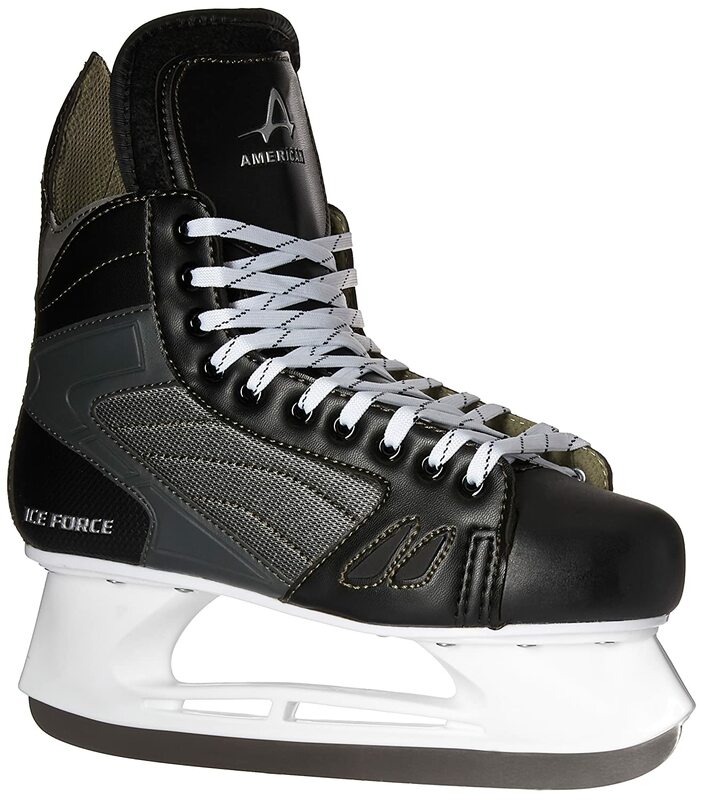 A great pair is the American Athletic Shoe Men’s Ice Force Hockey Skates. Multi-layer synthetic construction provides these boots with excellent foot and ankle support while also giving you protection from outside stimuli such as pucks and sticks. Their interiors are lined with a very comfortable Cambrelle material which absorbs moisture, and is very easy to break in. In addition, their toe boxes are made of a cut-resistant material. Their holders are made of nylon, giving them great durability, but not sacrificing anything in the way of sturdiness or flexibility. With carbon steel blades, they are great at withstanding wear and tear, and capable of gliding quickly as well as stopping on a dime. Online reviewers give these credit for the support they provide to their feet, heels, and ankles. Reviewers also love them for how well they glide and turn. Some reviewers criticize them for how uncomfortable they are, stating they left blister on their feet. However, the majority of viewers had no problems when it come to foot comfort. Overall, the American Athletic Shoe Men’s Ice Force Hockey Skates are a very nice pair for casual players who don’t expect to get everyday use out of them, but would still like to have something on hand just in case. Their construction and comfort may not rise to the lofty standard set by Bauer, but for the price, they are an absolute steal. If you’re looking for a passable pair of ice skates that you can use to play casual hockey with your friends, you should definitely consider the American Athletic Shoe Men’s Ice Force Hockey Skates. The quality of skate your purchase is directly related to the competition level of hockey you’re playing. If you’re a casual player who mostly participates in recreational hockey on occasion, it’s not necessary for you to spend a bunch of money on extremely high-performing hockey skates. Your main focus should be on affordability and comfort. You shouldn’t have much trouble trying to find something that is both comfortable and reasonably priced. They may not perform as well as high-end specialized hockey skates, but they will serve their purpose just fine. On the other hand, if you’re an experienced hockey player who plays in a competitive league, there are a number of things you must look for in a skates. They must be lightweight so that you can be as fast and as agile as possible. Hockey, like many sports, is a game of inches. Every millisecond matters, and you must be able to move at top speeds at all times. Another important thing to look for in high end hockey skates is durability. When playing hockey, you are likely to encounter a great deal of physical contact. If your skates aren’t created with top-notch construction and manufacturing, they are going to have a difficult time holding up through wear and tear. Foot protection and support is another very important aspect to consider. Look for a boot that is very stiff and padded. This will keep your ankle locked in place while also protecting the rest of your foot. Some high end skates even possess the ability to be baked so that they fit snugly to your foot. This will provide you with maximum comfort, allowing you to play at your best at all times. The first thing to consider when purchasing hockey skates is your foot type. By understanding your foot type, you understand what sized boot your foot can fit into. Hockey skates generally come with letters attached to them which notate their width and depth. D and R are typically used to notate boots with standard sized widths. E, EE, and W are typically used to notate large width boots. In most cases, each model of skate will be available in both standard width and large width sizes. Generally, if you wear standard width tennis shoes, standard width hockey boots are going to be satisfactory for you. The same goes for large width sizes. However, it would be wise to try a skate on for yourself before purchasing it. Everyone has a different foot shape, and you never know whether or not it’s going to be accommodated by a certain piece of footwear. The most important aspect of a hockey skate is its boot. The boot can be directly responsible for whether or not a player performs well, and so, should be examined carefully. 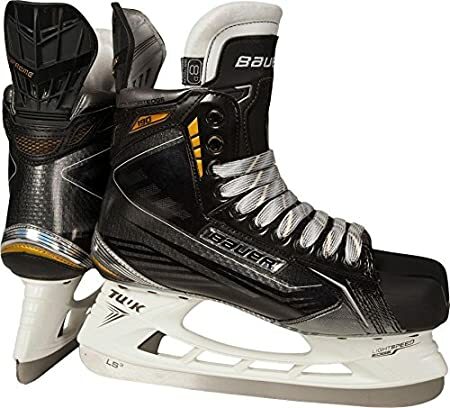 These days, there are several features that high end hockey skate boots may possess. Each of these features works to make the boot more comfortable, durable, lightweight, and functional. The quarter package is essentially the boot’s shell. It holds the padding in place and gives the boot support. A high quality quarter package is stitched so that the boot is as flexible as possible while still offering a great deal of support to the foot. Ankle padding can be placed into the back of the quarter package to lend support and cushion to the user’s ankle, reducing the risk of chronic injury. Proper heel support will provide the user with a natural foot arch while also snugly locking his or her foot into the boot. The boot’s tongue should rise to the top of the boot, protecting the front of the foot, as well as the sides of the ankles. Connecting the boot to the skate’s blade is a solid, firm surface called the outsole. A quality outsole is highly durable, and as rigid as possible. The foot bed and liner are on the interior of the boot. They provide the user’s foot with comfort, protection, and support, allowing the user to skate safely and securely at all times. Each skate is going to possess different construction qualities. It’s up to you to examine these qualities, and make the best purchase possible. Apart from the boot, there are two other components to the overall construction of a hockey skate. One of these components is the holder, and the other component is the runner. The holder is the plastic piece that’s attached to the bottom of the boot, while the runner is the metal blade attached to the bottom of the holder. In basic, beginner level skates, the holder and runner are one in the same. They are connected, and so can’t be replaced separately. In intermediate and competitive level skates, the holder and runner are two different pieces. They can be replaced separately if one of them is to break. Although it’s not easy for the holder or runner to break in any type of skate, it is possible if they are to be struck by a fast moving puck. Typically, if a one piece holder-runner combo is broken, it’s cheaper to just buy a completely new pair of skates. If a holder or runner is broken on a two-piece construction style, they can be easily replaced without having to purchase new skates. If you’re a competitive player who plays often, you should definitely go with a separate holder and runner. If you’re a casual player, you can go with either a one-piece of a two-piece. A pair of quality hockey skates can be the difference between performing well on the ice and barely performing at all. They’re two of the most important pieces of equipment any hockey player has at his or her disposal. This is why you can’t choose them flippantly. You can’t just take a shot in the dark and hope for the best. You have to do the research. You have to examine the quality of the construction, evaluate the foot protection value, and consider how each pair will affect your performance and play. If you do these things, you will undoubtedly come away with a pair of high quality hockey skates.